Timothy Bartik says that investing in early childhood education is not just good for the children involved — but for communities as a whole. 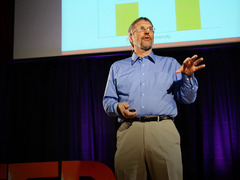 In today’s talk, he offers a detailed look at how preschool education boosts local economies in colossal ways. To hear exactly how it works, listen to this talk. His fresh perspective moves the topic of improving schools away from the altruistic “wouldn’t it be nice if…” level. In fact, it forces us to ask not “How can I get a good education for my kids?” but “How can I get a good education for everyone else’s kids?” It’s a shift in thinking — one that reframes the discussion about education reform. The TEDx program, with its global reach, is privileged to have a unique perspective on education. Below, watch five TEDx Talks (and one bonus TED Talk) that explore some of the social, economic and political implications of guaranteeing good schools. As schools were desegregated in the 1950s and 1960s, opponents feared that embracing students from low-performing, all-black schools would lower standards and unfairly disrupt white students’ performances. It’s been 60 years — were they right? No. As Rucker Johnson shows with his extensive research, desegregation had virtually no effect on white students, but propelled minority students to unprecedented levels of success. African American Vernacular English is a common dialect in the US. It’s not bad English, yet kids who grow up speaking it at home are too often misdiagnosed with speech and learning disabilities by teachers who either don’t recognize the dialect or give tests in their own dialect of English. At TEDxEMU, speech pathologist Sade Wilson sheds light on the issue and makes six recommendations to improve how teachers work with students who speak a dialect. If education is an essential social good, shouldn’t we make a bigger effort to figure out what’s worth investing in and what’s not? Governments invest in education, and governments invest in research, but according to Jim Shelton, many countries don’t invest much in education research. In this talk from TEDxMidAtlantic, he calls for expanding public investment into the research and development of new education practices and platforms. Kakenya Ntaiya made an unusual deal with her father in order to go to high school – something unheard-of for girls in her Maasai village. After continuing on to college in the US., Ntaiya returned to her village and set up a school for girls. In this talk, she shows how the school is changing the local culture by creating an alternative path for girls uninterested in marriage in their early teens. And now for a TED Talk with a similar theme: Bertie County was known for being the poorest region of North Carolina. In this talk, Emily Pilloton suggests that teaching design in school may be key to lifting the entire area. By giving students the tools to dream up and fabricate real projects for the community good, Bertie County got bus shelters and a farmer’s market – while students got paying summer jobs. si es de la gente para la gente es bienvenida, si es generada por el Estado, difícilmente se diseño para la gente y creara bienestar y desarrollo. Good Article. Education is important for everyone, it give a person to stand on his own feet. Now days many people pursue there education in audio engineering field. There are some good audio engineering schools in atlanta which can give you good training. Education can have many forms and parents can be even more active, sharing their passion with their kids and communities. Our project – http://bankaroo.com – is a virtual bank for kids, created by my 12 y/o daughter and me to help parents teach their kids about money and making smart financial decisions. I used this project to teach Danielle how to articulate concepts, design and validate software and developing web and mobile application. To date, our family project has grown into an international company with thousands of members around the globe. We added support to many currencies and native languages, with the help of our members. Our kids are our future – let’s build a better tomorrow with them.